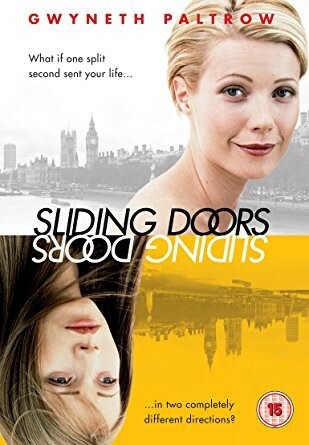 Have you ever seen the movie Sliding Doors? I saw it when it came out in 1998 and years later, it’s still so poignant in my life. Gwyneth Paltrow plays Helen Quilley in the story that chronicles two different directions her life would go in if she just makes a train vs missing it. In one story line she barely misses it because a little girl is in her way as she’s trying to get on the subway. Watching her life unfold in two completely different directions of a split-second “miss” is so interesting. It reminds me, sometimes, when I’m having a bad day or when something bad has happened, it might actually have “saved” me from something worse. When I’m sitting in an airport frustrated beyond belief, for instance, because my plane is delayed, I stop myself and envision what could’ve happened if the plane hadn’t been delayed…from the plane crashing to getting to the freeway at a different time and getting in an accident and becoming paralyzed. Whenever you’re frustrated, I suggest you do the same. Maybe that gift you ordered didn’t come in time for your best friend’s birthday, but it caused you to go to the mall for a last-minute gift and you ended up meeting the man of your dreams. Maybe that flat tired actually prevented you from hitting a child that ran into the road? This line of things often helps me feel grateful and accepting of the way things are! I hope it may help you too!